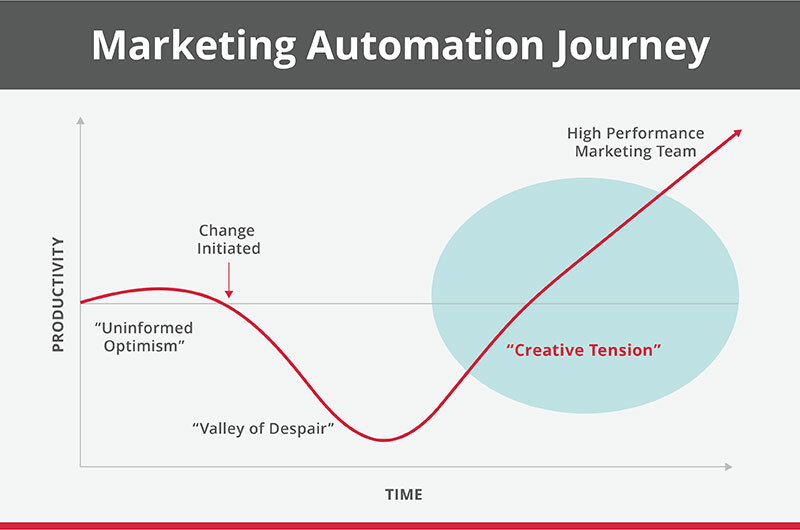 As we have suggested in some of our previous writings, a Marketing Automation project represents a significant break from business as usual for most organizations. In some cases, it may result in a dramatic, stressful, and potentially disruptive change for the business. 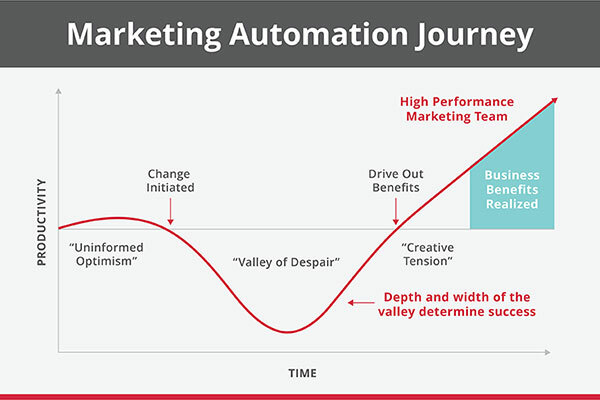 The reason for this is simple: a Marketing Automation Journey represents a new learning curve for people in your organization and it may be a very steep and transformative curve for some of your marketers. The stress of transformational change is accompanied by a sharp decline in performance at the individual and team level. We refer to this phenomenon of declining performance as the “Valley of Despair”, which is characterized by a steep fall in productivity, followed by a slow rise to previously established performance levels. 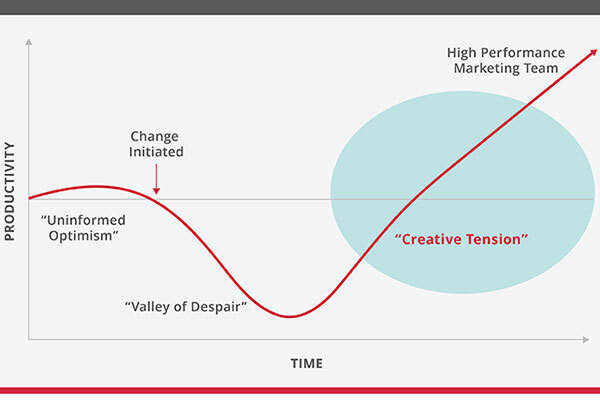 As the organization emerges from the ‘Valley’ and overall marketing productivity rapidly increases, a new form of stress and tension will occur. During this part of the journey, your people will begin speculating that there is another steep decline just over the next rise. The reality is that there is a gap between the promise of where you are headed and the reality of where you are. This results in additional organization tension, but in this case, it can also be a source of new energy for the team working on the Marketing Automation initiative. Under the right circumstances, as pointed out by Peter Senge, this kind of tension can help facilitate creativity and increase your team’s ability to change. Generating this kind of “creative tension” requires clarity about your desired brand destination and full organizational alignment on the “truth about today”. In other words, the gap and desired outcome need to be clear so people are motivated to change. When properly directed and harnessed, a little organizational tension is not necessarily a bad thing. Creative tension is a behavioral adaptation that magnifies creativity and facilitates transformational change. When you clearly articulate your brand destination and make apparent the gap between your destination and your current reality, you create emotional and energetic tension that seeks to be resolved. Robert Fritz, the author best known for his work on “structural dynamics”, calls this a tension-resolution system. Fritz helps us visualize by using the metaphor of stretching a rubber band – as you stretch it, this creates tension, and the tendency of the rubber band is to pull back to resolve the tension in the system. Imagine that your destination is represented by your right hand and your current reality is represented by your left hand, with the rubber band around both hands. The greater the gap between your destination and your reality, the more the rubber band will stretch, the greater will be the tension, and the stronger the motivation and energy will be to resolve that tension. And hopefully, the rubber band does not snap! When you are working on a Marketing Automation project, your people don’t want to hear from the CMO that “this is what I want” and then realize that “we don’t have it”. Your team will be highly motivated to alleviate that cognitive dissonance by closing the gap between your current reality and your destination, and so this allows you to release more energy, resources, and creativity into finding ways to close that gap. 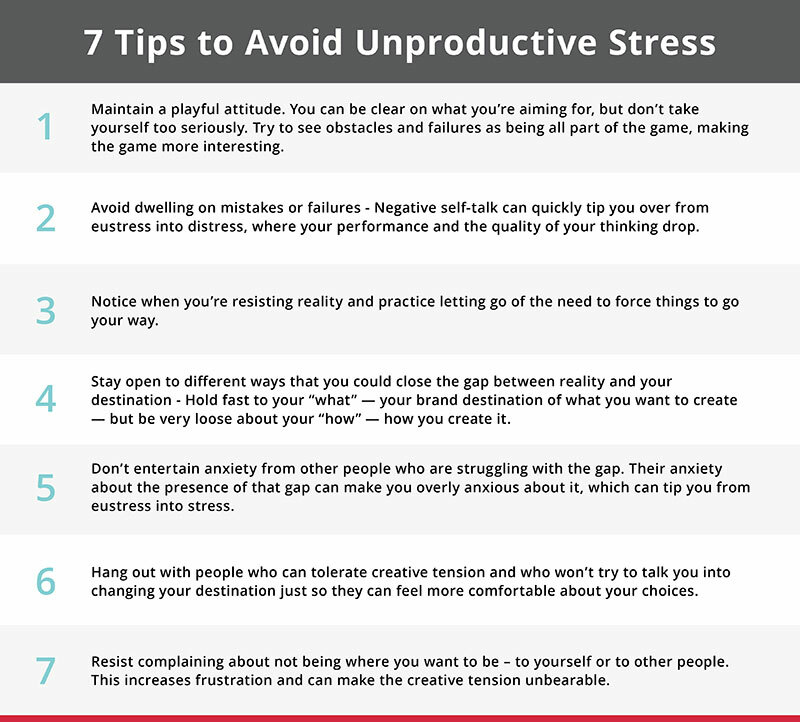 It turns out that this can actually be a very productive and good form of stress or “eustress“. As marketers, when we are faced with an unresolved issue or a big challenge, this triggers us to perform at our peak and release more energy into dealing with the problem, and generating solutions for better results. Betty Edwards, in her book Drawing on the Right Side of the Brain, talks about how we usually tackle problems with our left-brain-directed thinking first. If the left-brain can’t solve the problem, it automatically shifts the problem over to the right-brain. When we create creative tension, the left-brain is more willing to shift the problem over for the right-brain to get involved as well, and that’s when you start to find more creative solutions. 1. 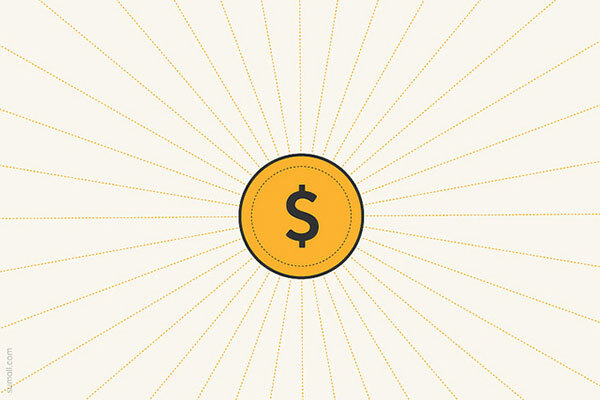 Clearly articulate your brand destination in as much detail as you can. Don’t worry about using metrics and goals. Just ask yourself the question, “What does success look like?” It’s also important that you’re describing a destination, and not an anti-destination. A destination talks about what you want, while an anti-destination is focused on what you don’t want. Focusing on what you don’t want makes your mind associate back into current and past problems, so it serves to reinforce the problem, instead of generating the desired creative tension. 2. Tell the truth about today. If you’re pretending that you’re somewhere you’re not, you’ll reduce the creative tension and run the risk of choosing irrelevant strategies to get to your desired destination. Watch, listen, and pay attention to the present. Ask for feedback and opinions from other people to get different perspectives on your current reality. Question all your stories about reality so that you can peel away the self-deception and the stuff that’s interpretive and get to the core truth of what your current reality is all about. Pay attention to defining the next obvious steps for bridging your current reality to your destination. You won’t necessarily know the full “how to get there” at the outset, but as you keep refining and articulating your perception of reality and your destination and keep taking the next obvious steps, you can trust that the creative tension will seek to resolve itself by getting you to where you want to be. Sometimes creative tension can feel pretty nasty – especially if you’re not well practiced in using it. It feels a lot like mental anxiety and it’s easy to get wound up with so much stress that you can’t think clearly and it all just feels really bad. One of the tricky things about creative tension is that there’s a sweet spot where the anxiety levels are “just right” to release your peak performance and best thinking. Too much stress and anxiety and you’ll drop into distress, and your performance and the quality of your thinking will plummet with it. So don’t go pushing yourself to articulate a ridiculously huge destination in the hope that creative tension will get you there. Big, hairy audacious goals for your Marketing Automation implementation are not always appropriate. It’s key to set up realistic goals! 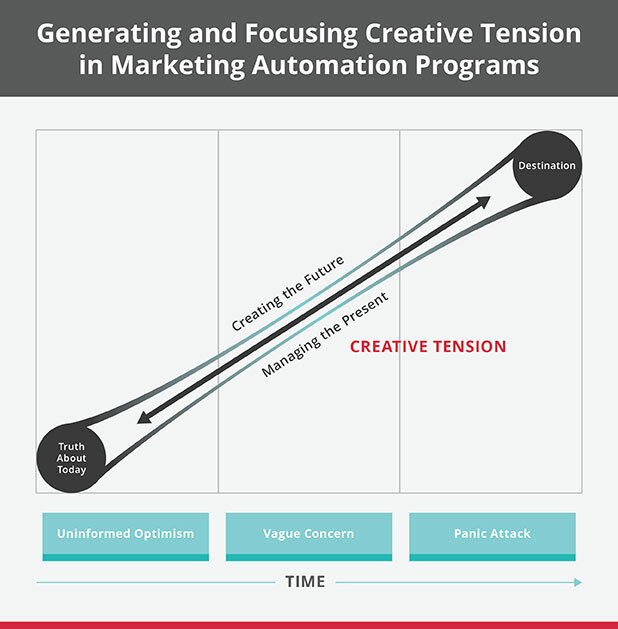 By understanding and identifying the ways to generate creative tension, you now have a great opportunity to magnify organizational creativity and facilitate the transformational changes you need for a successful Marketing Automation journey. Be sure to download our Marketing Automation Conditions for Success Diagnostic to help you identify if you have the Conditions for Success in place. Transformational Marketing, as the name implies, is about optimizing and mobilizing all marketing assets to create lasting preference for the brand, to activate customer purchase intent, and to accelerate organic growth of revenues and profits. To truly transform, marketing must get all 3S’s right: the right Story, the right Strategy, and the right Systems, all measured through the lens of Simplicity, Clarity, and Alignment. To learn more, download our latest eBook Transformational Marketing: Moving to the TopRight.